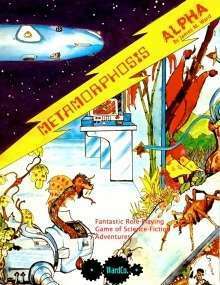 Metamorphosis Alpha was the world's first sci-fi role-playing game. Metamorphosis Alpha was originally published in 1976, and has since been released in a total of four editions. This old game is the granddaddy of all Post Apocalyptic games and was the inspiration for TSR Hobbies' game Gamma World. This booklet allows players to choose to play a human, mutant or mutated animal and provides descriptions of mutations and defects. It also provides rules for working out the mysterious and sometimes dangerous technological devices found throughout the Starship Warden. This game was state-of-the-art in 1976, and will be of interest to enthusiasts and collectors alike. Forget having to lug half a dozen books around to play this game. Its all here in this little book, without the need for supplements. This is classic Old School gaming from before anyone even knew what "Old School" was. This electronic edition includes grammar and spelling corrections, additional errata, and a short adventure. On page 14 of the book, page 16 of the pdf, the radius of effect of the Mental Defense Shield mutation for detecting other mental powers is 30 meters. On page 21 of the book, page 23 of the pdf, the reference under the heading of "Devices, Equipment, Duals and Weapons" to using leadership potential to determine the use of ship's items is incorrect. It should be mental resistance. the chart on the following page and on the reference sheet at the back correctly lists mental resistance. I hope that goodman game's print of the game get's uploaded as pdf someday. This title was added to our catalog on October 01, 2007.